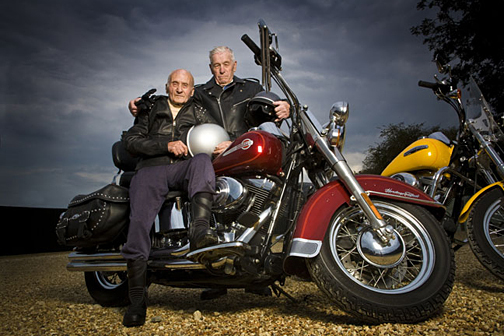 This was taken last year for the Sunday Times to illustrate a feature on Britain’s oldest bikers. It was one of those very rare assignments where everything was perfect. The two old bikers were lovely guys that looked like they had been supplied by Central Casting, the local bike store were more than happy to help out by lending me a couple of Harley’s, and helped kit the two guys out for me. The greyhound stadium opposite were cool about letting me shoot in their car park, added to that a perfectly moody sky, I left that job a very happy bunny. Although the sadly predictable postscript is the fact that the insurance company who cover these two bikers got their PR agency to ask if they could have free use of the image for their internal magazine. Although they were happy to pay the full fee when prompted! Mark Bourdillon has worked in Fleet Street for the past thirty years, both as a staffer with Express Newspapers and Today. He has been freelance since 1991 and continues to work for the Sunday Times and a variety of clients both editorial and commercial. Photographer since 1978, EPUK member since 2000.